Is CNH Industrial NV (CNHI) A Good Stock To Buy? Is CNH Industrial NV (NYSE:CNHI) undervalued? Hedge funds are buying. The number of long hedge fund positions advanced by 2 in recent months. Our calculations also showed that CNHI isn’t among the 30 most popular stocks among hedge funds. CNHI was in 16 hedge funds’ portfolios at the end of December. There were 14 hedge funds in our database with CNHI holdings at the end of the previous quarter. At the moment there are a large number of signals investors employ to evaluate stocks. 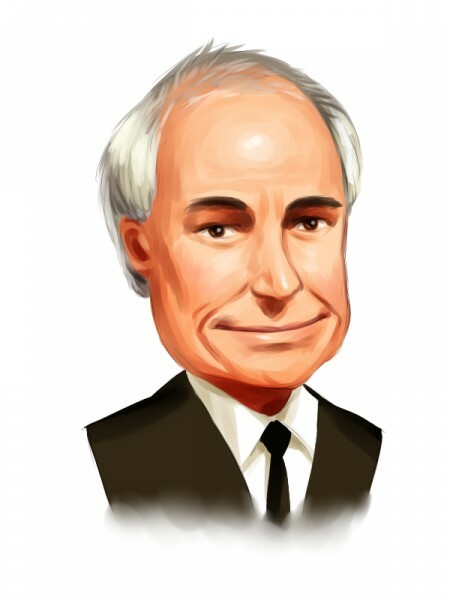 A couple of the most innovative signals are hedge fund and insider trading moves. We have shown that, historically, those who follow the top picks of the top money managers can outpace the broader indices by a significant margin (see the details here). We’re going to take a look at the recent hedge fund action regarding CNH Industrial NV (NYSE:CNHI). What have hedge funds been doing with CNH Industrial NV (NYSE:CNHI)? At the end of the fourth quarter, a total of 16 of the hedge funds tracked by Insider Monkey were long this stock, a change of 14% from one quarter earlier. 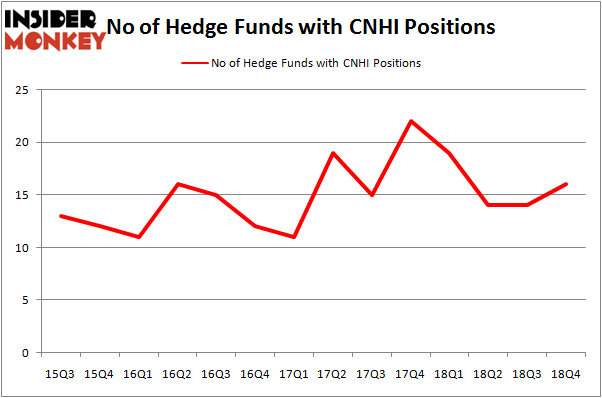 The graph below displays the number of hedge funds with bullish position in CNHI over the last 14 quarters. So, let’s see which hedge funds were among the top holders of the stock and which hedge funds were making big moves. The largest stake in CNH Industrial NV (NYSE:CNHI) was held by GAMCO Investors, which reported holding $116.6 million worth of stock at the end of September. It was followed by Southeastern Asset Management with a $97.3 million position. Other investors bullish on the company included Arrowstreet Capital, PDT Partners, and Carlson Capital. As aggregate interest increased, specific money managers have jumped into CNH Industrial NV (NYSE:CNHI) headfirst. PDT Partners, managed by Peter Muller, created the most outsized position in CNH Industrial NV (NYSE:CNHI). PDT Partners had $21.2 million invested in the company at the end of the quarter. Clint Carlson’s Carlson Capital also initiated a $10.1 million position during the quarter. The other funds with new positions in the stock are John Overdeck and David Siegel’s Two Sigma Advisors, Matthew Tewksbury’s Stevens Capital Management, and Matthew Hulsizer’s PEAK6 Capital Management. Let’s now take a look at hedge fund activity in other stocks – not necessarily in the same industry as CNH Industrial NV (NYSE:CNHI) but similarly valued. We will take a look at STMicroelectronics N.V. (NYSE:STM), ZTO Express (Cayman) Inc. (NYSE:ZTO), Darden Restaurants, Inc. (NYSE:DRI), and Alexandria Real Estate Equities Inc (NYSE:ARE). This group of stocks’ market caps resemble CNHI’s market cap. As you can see these stocks had an average of 20.75 hedge funds with bullish positions and the average amount invested in these stocks was $466 million. That figure was $296 million in CNHI’s case. Darden Restaurants, Inc. (NYSE:DRI) is the most popular stock in this table. On the other hand STMicroelectronics N.V. (NYSE:STM) is the least popular one with only 11 bullish hedge fund positions. CNH Industrial NV (NYSE:CNHI) is not the least popular stock in this group but hedge fund interest is still below average. This is a slightly negative signal and we’d rather spend our time researching stocks that hedge funds are piling on. Our calculations showed that top 15 most popular stocks among hedge funds returned 19.7% through March 15th and outperformed the S&P 500 ETF (SPY) by 6.6 percentage points. Hedge funds were also right about betting on CNHI, though not to the same extent, as the stock returned 15% and outperformed the market as well.